Did you know the pineapple is the international symbol for Hospitality? .....We do! That's why we know what makes a holiday rental right for our guests - whether it's a safety barrier gate for the little one, movies and internet for the teenagers, ski with a professional or a restaurant reservation for the honeymooners. This means our guests become your business! With over 400 positive reviews on AirBnB alone, we are always striving to give your guests the best in Snowy Mounatains Holidays! This attention to detail flows through to our property management. you require in a property management company. 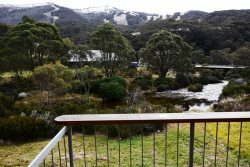 As the holiday division of Ray White Jindabyne you can be assured the link with the Ray White group will afford you all the advantages of this leading name in Australian Real Estate. Is it time for a change to a progessive management company? Fully versed in the national and international short term holiday market? We love managing holiday properties!